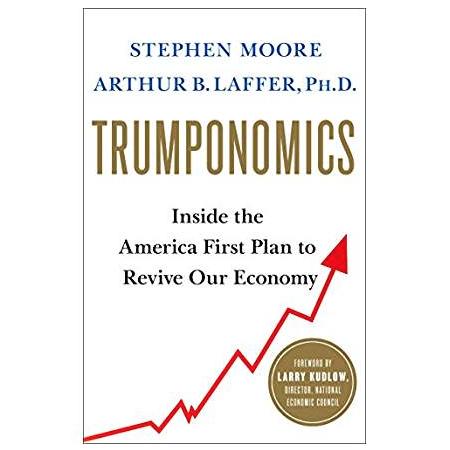 Audioboom / @StephenMoore: Trumponomics is roaring ahead at almost 3.5%, said to have been impossible by the previous Administration. Growing in a way that’s the envy of the planet. @StephenMoore: Trumponomics is roaring ahead at almost 3.5%, said to have been impossible by the previous Administration. Growing in a way that’s the envy of the planet. Steve Moore, Heritage Foundation and author, Trumponomics, in re: Greg Ip (no fan of Trump) published in the Wall Street Journal tonight: the US economy is firing on all cylinders. He notes that the US GDP is growing at 3%, which was formally pronounced impossible by the previous Administration. Consumer confidence, consumer spending, industrial growth. In fact, it looks closer to 3.5%. Yes, I’m a bit nervous about today’s stock market decline and the housing market, but there’s no recession in sight. This is Trump’s policies. The Fed has pronounced that it’ll keep raisin rates again ad again in 2019 – and that’s unnecessary. Art Laffer, Larry Kudlow and Steve Moore have said: Growth does not cause inflation. What impels this economy? Deregulation tax cut, and energy policies – we’re producing so much today; the broader point is that it's not any one thing, it’s the fact that we have a president who put this country first, and he’s pro-business. Business owner say, I know that if I expand, put up a new building, the govt won't come along and whack me in the head. Trumponomics – the people the president has put in key positions are also pro-business. Whatever he’s doing, it's working. The animal spirits have been unleashed by Trump, and they won't be stuffed back in a bottle in 12019. JB: If you create conditions where the American people get to make their own decisions. Liberals always say why we can't-- but, yes we can. . . . Is anyone complaining about not paying $2.50 a gallon? . . . We borrowed a lot of policies from Reagan.